Our superior methods of printing means every one of our flags are manufactured to the highest standard. Each advertising flag is water-base digitally dye printed in full color, resulting in excellent color matching and deep, rich color contrasts. This flag fits our mini table top flag. Has fiberglass flag pole. Height is 20" and graphic size is 15.5" x 7.25". Comes in a set of 6 flags. Perfect for personal or business use, such as conference room, trade-shows or even put it on desk or table at home. 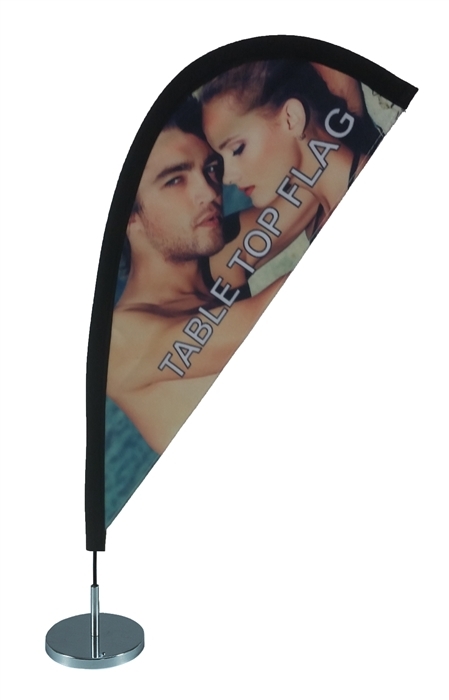 Available in either one or two sided custom printing, these ADJUSTABLE mini teardrop flags are sure to get your business increased attention by your potential customer. If you need art assistance with your graphic template, please add the custom art setup charge. Your graphic will then be assigned to a qualified graphic designer who will assist you with your logo and typesetting. The custom art setup charge is either a 1 time ($45.00) fee for assistance with a pre-set typesetting, logo and vector file (PDF, EPS, AI), or if you need more in depth assistance it is then a $75.00 an hour charge. The art setup charge will be waived if you do not need assistance. For an estimate please call 888-675-9610 or email us at info@bannerandflagwholesalers.com. If your file is too large for email, options include dropbox.com or FTP to our server. Get your mini suction cup teardrop flag kit today! Best quality construction available. Lowest pricing GUARANTEED!!! Graphic size: 15.5" x 7.25"
Usually ships in 7-10 Business Days, typically sooner. **Note**- Time frame for turnaround time begins once the artwork has been approved. If artwork is approved before 3pm PST then artwork will be submitted that business day for printing. If artwork is approved after 3pm PST artwork will then be submitted for printing on the following business day. Website owned by Sign Pipers, Inc.
All Rights Reserved. Powered By Volusion.